“sumika” the band I mentioned twice in this blog before is going to show up in “M station”, a TV program, on September 7th. This band sings the theme song “Haru Natsu Aki Fuyu” and the opening　“Fanfare” of a movie titled “Kimi no Suizo wo Tabetai” which was released on September 1st. Both songs are as really good as I expected, especially the theme song “Haru Natsu Aki Fuyu” made me think that it would be a great one as soon as I listened to it. it is unusual for me to be attracted by lyrics first, but this time I was. Usually, I don’t care what the lyrics are like and I just enjoy the performance or the sound itself. 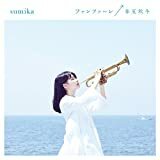 Actually, I was fascinated by the varied sound of sumika at first. However, I have gradually paid attention to their words to feel they are really talented in that part as I have listened to their songs repeatedly. Though I can’t understand some part of their lyrics, in some part they are meaningful and in some other part they make me feel somewhat wistful pang. Basically, I watch M station only when my favorite musicians appear, now I’m really looking forward to the TV program.